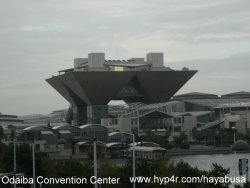 Odaiba is a relatively new area in Tokyo built up from largely reclaimed land. I guess you could describe it as a planned community based around leisure and civilized entertainment? These are plenty of descriptions of the various attractions there so I won't talk about those - what I will tell you are what I believe are the best parts for the automotive and tech enthusiast! It's easy to get to so I won't bore you with the details, that said you must catch the mono rail that goes around the area otherwise you could be walking a very long time. You could also take a taxi across the rainbow bridge but that's expensive! The Rainbow bridge is interesting named because its basically a white bridge during the day with the lights coming on in the evening and its only three colors. Once in Odaiba you should stop at Palette Town. (I know it sounds like something out of Pokemon!) It's essentially a big shopping complex. Aside from that it's also the home of the Toyota Mega Web The Mega Web is basically a huge and permanent Toyota promotional complex. As you can see by the web site you can even test drive almost all Toyota vehicles. You really have to make appointments because there where tons of people waiting. The history garage houses many non-Toyota exhibits too, like a DeLoren! but for me the most interesting thing by far - were the old Toyota Ads! It's a bit of retro that the young really need to see! Ads bring back often fond memories of years past - YES you see flares, the string backed gloves, the smoking, the over the top stereotypes, the odd colors, car heaters being featured as standard equipment - they even explained what SR5 really means! We had to be moved on by staff as I think we hogging the space! Yes Toyota really rules in Tokyo they gave every model to suit your needs and I checked them ALL out! The display included past concept vehicles. So even if you don't care for the brand it is worth checking out. For new visitors plan at least 3 hours there. Entry is free too! Other attractions in Palette Town - include a pet restaurant. It's a place where you can take your too for dinner. This is the first one I've seen incidentally. Also check out Venus Port which is an Venice themed shopping center, namely the interior facades resembles Venice without the water of course. If you've been to Venice ... nice try and ambience though. If you go on clear day take the Ferris wheel ride, one of several in Tokyo which is over 100+ meters gives a great view of the city. Then take a look at the Panasonic display building which you can see the latest and yet to be released products. The Miraikan (a science museum) is definite worth a visit as they have tons of things to see and and do. Of interest to me were the neutrino demo, a reconstruction of the space station, so you can finally work out how they go to toilet! It' s weird by the way. The star of the show is of course Honda's ASIMO. I watch a demo and it moves amazing, what's more it's eyes follow you around when it's not moving! Didn't notice until I saw the photos and video. There is lots to see - of note is the building on top of this page - Tokyo International Exhibition Center, the miniature Statue of Liberty, Fuji TV and so forth. Overall definitely worth a visit it will take all day or two to see all of it. Since I have visited before I was there just for any updates! The next post I'm writing up is probably what you've been waiting to read. It's all about my trip to Hamamatsu - the HQ for Suzuki.